ARP Kongō — Japanese Tier V battleship. A Battleship of the "Fleet of Fog". Modeled after the lead ship of the Imperial Japanese Navy's Kongo-class, Kongo. As the flagship of the "First Oriental Fleet", her Mental Model "Kongō" honors the Admiralty Code above all else. She seeks to eliminate the submarine I-401, who chose to deviate from the Code. 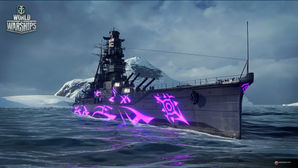 This warship has been specially designed for World of Warships, and is modeled after Kongo as she appears in "ARPEGGIO OF BLUE STEEL -ARS NOVA-". While ARP Kongo is a great reproduction of Kongo as she appears in the anime series Arpeggio of Blue Steel -Ars Nova-, she unfortunately (and fortunately for every-ship else) does not come with the overwhelming firepower, blistering speed, submergence ability, matter destroying corrosive warheads, annihilating super-graviton cannon, and impenetrable wave force armor of Kongo in Ars Nova. In other words, in the game she is a standard Kongo, and will have to resort to intelligent tactics like any other warship to gain an upper hand. As she performs exactly like standard Kongo(C), see the article on Kongo for her performance appraisal. ARP Kongo comes fully upgraded, with the same upgrade slots found on Kongo and a captain which may or may not have free Commander Skill points, depending on the event and region. As this is an ARP ship, ARP Kongo cannot mount camouflage. Kongo’s mental model, and captain in the game. Kongo as she appears in Ars Nova. Kongo in Yokosuka port, modeled after her appearance in Ars Nova. Kongo in Yokosuka port, showing her luminous patterns. Kongō (kanji: 金剛, katakana: コンゴウ) The flagship of the Second Oriental Fleet and Yamato's second in command. Kongō (Kongou), in the Ars Nova anime adaptation of the Arpeggio of Blue Steel (Aoki Hagane no Arpeggio 蒼き鋼のアルペジオ) manga, commands one of the fleets that are blockading Japan. Aware of the I-401's existence, she assigns the heavy cruiser Takao to intercept the I-401’s attempt to reach Yokosuka port. Takao falls victim to the I-401, however, and ends up switching sides so that the I-401’s human commander, Gunzō, might command her. Kongō sees this as blasphemy and in blatant disregard to the Admiralty Code. She also sends the fast battleships Haruna and Kirishima to assault Yokosuka and draw out the I-401. Kongō becomes increasingly vexed as these two ships also fall to the I-401 and her human commander Gunzō. As a result, she devotes all her resources to pursuing Iona and the other Mental Models who joined Blue Steel. She believes to be acting abnormally due to their contact with Gunzō. After several other altercations, a large battle ensues. Will Iona be able to get Kongō to listen to reason, or will she ultimately fall to Kongō's plans? In the Cadenza film, she returns wearing a different outfit and helps to save I-401 and restore her systems from the Student Council Fleet. She then engages in a fight with her sister Hiei, allowing I-401 to deal with Musashi. Her actions put the I-401 on equal footing in the climax of the movie, but can the I-401 and her human crew exploit the opportunity? Sadly, Kongō’s role in the manga is more peripheral, often seen as a character who is on the sidelines communicating with the other Mental Models. Her role comes to fruition in later chapters, however. The pagoda mast of ARP Kongō is inaccurate, as the game's model of Kongō (on which ARP Kongō is based); it is actually modeled after Hiei. Hiei sported a mast that was distinct from that of her sisters, which was a prototype of the masts that were eventually given to Yamato and Musashi. Also, ARP Kongō lacks the air search radar that was fitted on top of her range finder, and while there is a fully textured plane on ARP Kongō, the Fleet of Fog ships in Ars Nova never carried aircraft. This page was last modified on 19 February 2019, at 04:59. This page has been accessed 38,501 times.